Two rules: 1) I am always right. 2) No cheating. Cell phone usage is punishable by death. 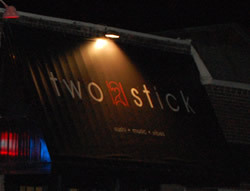 Welcome to Two Stick Trivia Tuesday. As the name implies, Oxford’s favorite sushi bar hosts trivia night every Tuesday at 10 p.m. If you want a good table, get there at 9. However, you cannot be seated before 10:00 unless you order from the menu, and appetizers don’t count. The entry fee is $5, and Pabst Blue Ribbon is in endless supply for $1. -Select a team name. (Bong Hits for Jesus and Standing at the Edge of Tomorrow TODAY, Today, today… are already taken.) *That last one is for the twenty-somethings and their Saved by the Bell…The College Years unwarranted obsession. -Submit team name, pick up score cards and pen from stage. -Pick up PBR supply from bar, wait on the announcement of the aforementioned rules. A) Name 5 of George Carlin’s words you can never say on television. B) Name Jim Carey’s top 5 highest-grossing films. C) Name the last 5 teams to win the College World Series. D) Name the 5 most populated cities in Canada. * Rounds 1-4 contain 5 questions worth 1 pt/correct answer. The Wild Card round allows 5 answers for each category; 20 points can be awarded overall for all complete answers in each category of Wild Card. First Place takes home the pot of $5 entry fees and enough pride to last to the next Tuesday.